Marie Gaye, the president of YAAPD, is a junior in Pauli Murray College. Marie is Senegalese-American and grew up in Senegal, New York, Louisiana, and Tennessee. Marie is majoring in Molecular, Cellular, and Developmental Biology and has an interest in medicine, global health, and policy. In addition to serving on YAAPD board, Marie is co-president of the Urban Improvement Corps, an organization dedicated to solving education inequity in New Haven through tutoring, mentorship, and other academic and creative support programs. Marie is passionate about topics related to the African diaspora and health and medical practice on the continent,. Feyi Falana, the vice president of YAAPD, is a sophomore in Morse College. She is double majoring in Political Science and African Studies. Feyi is a Nigerian-American who was born and raised in New York to Nigerian immigrant parents. In addition to YAAPD, she is involved with the Yale Undergraduate Legal Aid Association, Yale Steppin’ Out and Yale Chi Alpha. She also serves a research assistant in the Political Science Department as well as a volunteer teaching Yoruba to children of various ages. Feyi is extremely passionate about social justice issues on the African continent as well as getting African youth involved in combating inequities found within oppressive systems. She hopes to have a law career that focuses on fighting for the acceptance of all people through policy reform across Nigeria and the United States. Naasey is a sophomore in Pauli Murray and a prospective Economics and Mathematics major. She is from Tema, Ghana and interested in investigating the use of mathematical models and techniques to understand socioeconomic and sociocultural trends on the continent. Naasey is also involved in article writing for various on-campus publications, and serve as math tutor in a New Haven high school. She loves to eat (fufu is her favorite) and binge watch random YouTube videos for fun. John Agoh is a sophomore in Saybrook College double majoring in Film and Media Studies and African American Studies. Born and raised in Port Harcourt, Nigeria, he currently resides in San Diego, California. He is especially interested in forms of 21st century artistic and cultural production on the continent and more specifically, postcolonial African cinema and visual art. He is also passionate about critique as a tool for dismantling oppressive systems. Outside of the classroom, John works as a student worker at Robert B. Haas Family Arts Library and as a gallery assistant at Artspace. 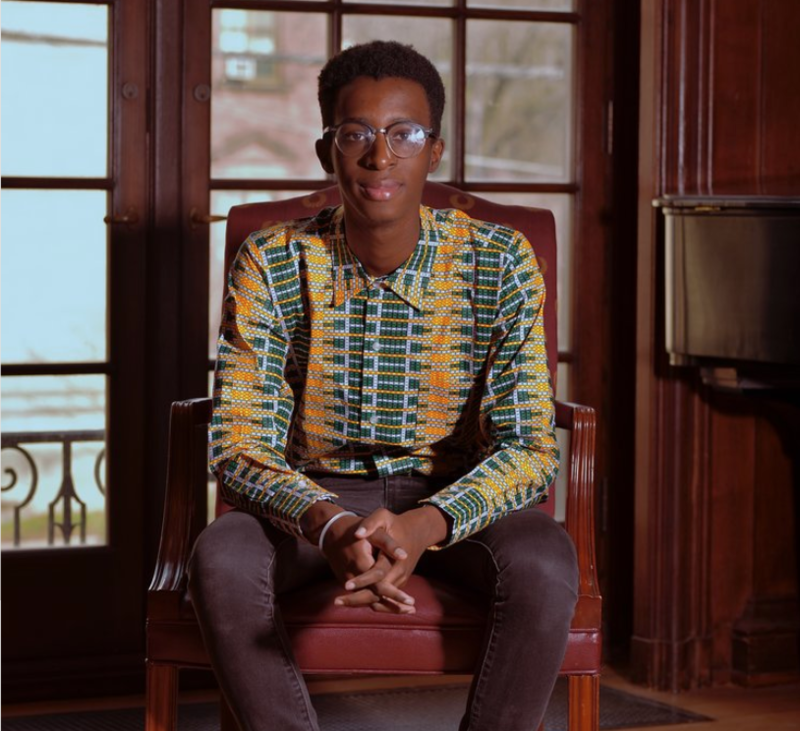 He is also a member of the Yale African Students Association, a co-coordinator of Yale Community Kitchen and on the programming committee for the Yale Student Film Festival. Seyade Tadele is a sophomore in TD from Minneapolis, MN. Seyade is an economics major interested in the economics of education. Aside from being the co-director of publicity for YAAPD, Seyade spends much of her time working at the House as a student staffer and is on the board for the Black Student Alliance at Yale. As an Oromo (an ethnic group of Ethiopia), Seyade hopes to engage in more conversations centered around the recent changes in Ethiopia’s political climate. She is very excited for this year’s theme and especially the conversations centered around access to education on the continent. Melat Lulseged is a sophomore in Franklin majoring in Global Affairs. Melat is Ethiopian-American and was born and raised in Los Angeles. In addition to YAAPD, she is involved with Yale UNICEF and the Yale Undergraduate Legal Aid Association. Melat is interested in how economic policies can be shaped to promote human rights protections globally, especially in regions undergoing rapid development. This is Melat's second year serving on the YAAPD Board, and she is excited to continue to be a part of an organization which provides a platform for powerful conversation and vibrant community. Joan is a sophomore in Davenport College from Port Harcourt, Nigeria and she currently lives in San Diego, California. She is a prospective ERM and African Studies major and incredibly passionate about fighting systems of inequality in a way void of neo-colonial tendencies. Joan is also passionate about the redefining of “Africanness” and the reclamation of pride and joy in our numerous cultures as a form of resistance. She works as the Student Assistant of the Council on African Studies, Macmillan Center at Yale, volunteers at a weekly soup kitchen in New Haven and serves on the board of DZANA, Yale's only afrobeat dance group. In her spare time, she will probably be found eating, thrifting, dancing, or listening to music. Fred Jr. Ebongue Makolle is a sophomore in Benjamin Franklin college. He is majoring in Statistics & Data Science and/or Economics. Fred was born and raised in Yaounde, Cameroon. He is also a member of the 1701 Golfing Society, Yale e-Sports Club and the Yale Undergraduate Sports Analytics Group. Fred is extremely interested in exploring the role of technology in the development of Third-World economies as well as the use of the internet as a medium for the propagation of positive and negative socio-political change. He is a big foodie and loves to scroll through Facebook for memes. Somto Okereke is the Director of Finance of YAAPD. He is Nigerian but grew up in London, United Kingdom before starting at Yale. He is a third-year Economics & African Studies double major in Jonathan Edwards College. He is particularly interested in private sector approaches to sustainable development and has experience working as an in-field research consultant for the Global Environment & Technology Foundation. In his spare time, he enjoys playing rugby and chess, as well as making music. Cyusa is the Finance Coordinator and a Rwandan first year in Silliman College. He grew up in Rwanda, the US, England and India before coming to Yale and hopes to become a lawyer. He is particularly interested in issues concerning affordable housing in Africa. Outside YAAPD, he likes to sketch, watch movies, and watch youtube videos analysing those movies. Christelle Umubyeyi is a Junior in JE majoring in Environmental engineering. Christelle is from Kigali, Rwanda and thinks everyone should visit at least once in their lifetime. Christelle is passionate about international development and innovative solutions to problems such as water scarcity and energy poverty around the world. Outside of class, Christelle works in an environmental engineering lab and is a chaplaincy fellow. Christelle loves languages and is always looking for opportunities to learn a word or two from any language. If you see her on campus, please teach her a word from yours! Jamachi is a senior in Branford majoring in Neuroscience, as well as a Development Co-Director for YAAPD. He is also a Nigerian-American, having been born and raised in the states. Jamachi is interested in the advancement of all African countries, and believes this can be best accomplished through unity and honest communication, both internationally and transnationally. He is also quite interested in health policy on the continent and hopes to pursue an MD/MPH to more successfully combat the multifaceted issues he has seen with regards to policy formation, regulation and implementation. As a Development Co-Director, Jamachi is excited to see increased diversity of panelists, forums and cultural showcases, along with more participation from CT schools. Jaccaranda Woldemariam was born and raised in Ethiopia until she immigrated to the US at 8 years old. Her interest in joining YAAPD stems from experiencing and observing the necessity for sustainable aid and development in her home country, in addition to realizing that this issue permeates throughout the African continent and needs to be addressed generally, but specifically by the Diaspora. Jackie’s main interest in enacting these types of changes lies in increasing women's education and empowering start up businesses on the continent. On campus, Jackie is part of Matriculate, which is an organization that helps high achieving low income high school students "matriculate" into high-graduation rate institutions, the Yale Undergraduate Legal Aid Association, and Dzana (Yale's African dance group). She also works as a House Manager for the AfAm House and volunteers at IRIS as a Dwight Hall Urban Fellow. Debbie Dada is a Nigerian-Canadian History of Science, Medicine, and Public Health major who aspires to work in health system management in West and Central Africa in order to improve infant and maternal health. She has particular interest in the social determinants of health and strongly believes in the importance of education as a tool in improving health outcomes. Debbie serves as a development co-coordinator for YAAPD, a staff writer and associate editor for the Yale Global Health Review, and a Student Assistant at the Afro-American Cultural Centre. In her free time, Debbie enjoys playing for the Yale Women’s Rugby Team and doing graphic design.